Hermit crabs are unique among crustaceans—they have soft abdomens that are not protected by a naturally grown shell. To protect themselves, hermit crabs have to take possession of the shell made by another mollusk. From there on, they carry the shell around and hide from predators inside of it. But because they do not grow the shell themselves, hermit crabs must obtain new shells periodically as they outgrow the ones they have. The process by which they obtain a new shell generally involves either finding one that is uninhabited or taking one away from another hermit crab. In places where empty shells are scarce, competition for shells can become intense. 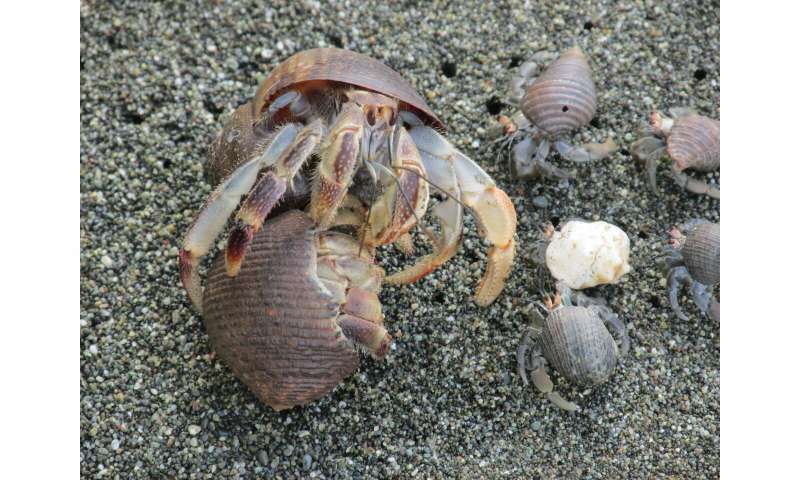 In this new effort, the researchers have found one of the ways hermit crabs ward off the advances of would-be shell thieves—by using vibration.